Soma Seeds Founder is the very talented and famous rastafarian Soma.Back in 1967 Soma was working as mail clerk in the city when he offered some marijuana for the 1st time and instanly fell in love with the calm feeling it had brought to his life. Soma Began growing seeds in 1971 organicaly and in a Eco friendly manner.Over the years Soma Seeds has developed into a fantastic range of regular and feminized marijuana seeds, Below is just a small selection of some of the highest quality Soma Seeds available with price match guarantee and worldwide discreet shipping. Complete range of Soma Seeds High Quality Marijuana Seeds for sale. Soma Seeds Amnesia Haze Won 1st place at the 2004 High Times Cannabis cup she is a genetic wonder and coffee shop favorite with smokers from around the world. Amnesia Haze is not he quickest strain to grow and can be quite a challenge for inexperienced growers. , Amnesia Haze will need to flower for 12-13 weeks to get the best results so be patient and you will be rewarded with a beautiful marijuana plant with Huge Buds.Amnesia Haze can be grown in Hydro/Soil with an average yield of 50-60g per plant or 600g per square metre under a 600w sodium blub. The taste is simaliar to Lemon citrus and the stone is very relaxed and a surprisingly lazy high.It certainly lives up to its name Amnesia Haze! Soma Seeds Lavender Won 1st place in the 2005 High Times Cannabis Cup for Best Indica. A true short flowering Indica Soma Seeds Lavender is versatile, performing well for both indoor and outdoor growers. She does very well in a screen of green (SCROG) setup.Buds form tight chunky nuggets with hints of purple in the tips of the calyxes, as well as the soft pine bouquet and a sweet, grapey taste on an earthy foundation. Her very frosty veneer of glands will please both the connoisseur of indica potency and the hashish fan.Excellent Medical Marijuana strain the high is strong, deep stone delivers when it comes to treating chronic pains and inflamations, among other conditions. Soma Seeds Buddha’s Sister won 2nd place for Best Indica at the High Times Cannabis Cup. Soma renamed the previous Soma Skunk V+ to Buddha’s Sister to suit her tendencies and advance appeal to the Amsterdam coffee shops such as De Damkring. Soma Seeds Buddha Sister is a cross of Afghani Hawaiian and Reclining Buddha. Soma Buddha Sister has increased yields, She grows tall with lots of side branches exploding with fluffy loosely packed buds full of greasy sweet resin, so she is better to grow as a multi-branch plant instead of in a sea of green if you have the space. Recommended for Medical Marijuana users with theraputic conditions Soma Seeds Buddha Sister High is powerful creative and cerabal a very nice stone! Soma Seeds Nyc Diesel Won 2nd place 2001,2003,2004 for Best Sativa at the High Times Cannabis Cup.Nyc Diesel is a high yielding, stretchy strain that produces light green, frosty, sour flowers that have a pinkish colour when matured.Soma Seeds Nyc Diesel Seeds are best if you let them mature for the full 10 weeks and then the taste lingers in your mouth well after you exhale. It is recommended to pinch and bend the tops as she grows, due to the stretch, this will also improve yields. Height can be an issue with this Medical Marijuana strain, however, you can still take advantage if this strains stretch in the first 3 weeks by putting your rooted clones directly into flower for a 3-4 foot finish or 1-1.3 meter finish. Soma Seeds Nyc Diesel are great for the beginner or the experienced grower alike, this is because she is not too nutrient sensitive and can be worked to perfection! Soma Seeds Reclining Buddha won 3rd place for best Indica in 1999,She is a 3 way genetic master of Hollands Hope a dutch variety from the 80’s Big Skunk Korean and Super Skunk.Reclining Buddha is another short plant the buds develop reddish hairs early but she needs a full 9 weeks in flower to completely mature. The buds are tight and long so this plants suffers very little mold problems.A good yielder indoors but outdoors this plant will grow big even in humid conditions. The smoke is always of high quality and has many Medical uses the stone is uplifting,creative with lucid dreaming and mental stimulation along with a sweet taste of candy cherry a excellent all round strain. 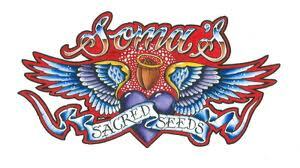 Buy Soma Seeds and receive free Marijuana Seeds with every order!